You must make reservations at least 5 minutes in advance of the time at B&G Oysters. B&G Oysters is a modern yet classic take on the oyster bar. Located in Boston's South End, B&G Oysters has a decidedly neighborhood feel, combining polished but friendly service with fantastically fresh seafood dishes and food-friendly wines. 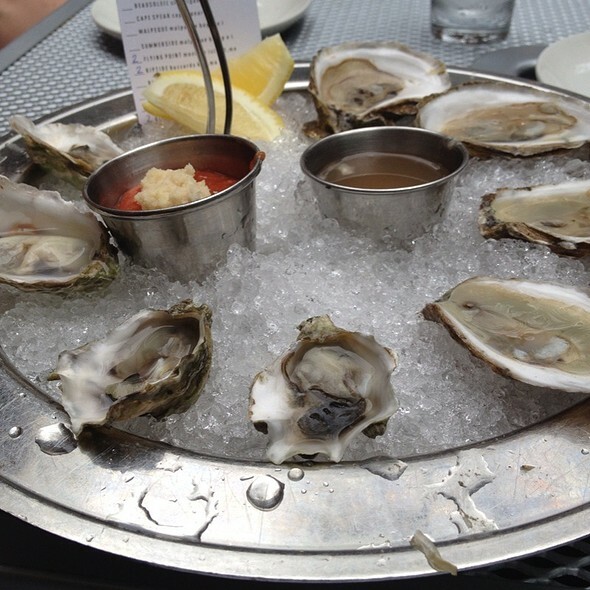 B&G Oysters has received many accolades over the years for its cuisine and wine program including "Best Seafood" in 2007 and 2008 by Boston Magazine. This subterranean spot draws energy from its open kitchen which is surrounded by a white marble bar. In warmer weather, enjoy drinks and more on the stone patio; a favorite outdoor dining spot in the city. Please note that all reservations are for the interior of the restaurant. Our patio is available solely on a walk-in basis. Fried oysters and lobster are the best! Service is impeccable, thank you Hilary. Was sorry to hear Randy left, he will be missed. My Partner and had Dinner at B&G as a celebration for finishing the Boston Marathon and the food was absolutely amazing! I love seafood, fresh seafood and was not disappointed. From the raw Oysters to the Shrimp Ceviche to the home made tagliatelle every was impeccable and the service provided by our waitress was exceptional! Food was outstanding, down to the tips of the perfectly cooked asparagus. Our server was in control of everything. She kept busy between taking care of all of the tables she had, kudos to such a pro. Very busy night, marathon weekend and the outside patio was open due to the spring weather. We started with a King Crab and Sweet Potato Salad that was tasty and refreshing. The second course were some of the tastiest fried oysters with a unique tartar sauce that did not overpower the oyster flavor. We shared the striped bass entree. The outside was nicely crisped but the inside was moist. We are from the Houston area and used to eating fresh seafood and every bit of what we ate did not disappoint! Amazing dinner. Oysters were fresh, lobster roll amazing, service top notch! Excellent food, friendly service made it cosy on a quiet Monday lunchtime. I will return. 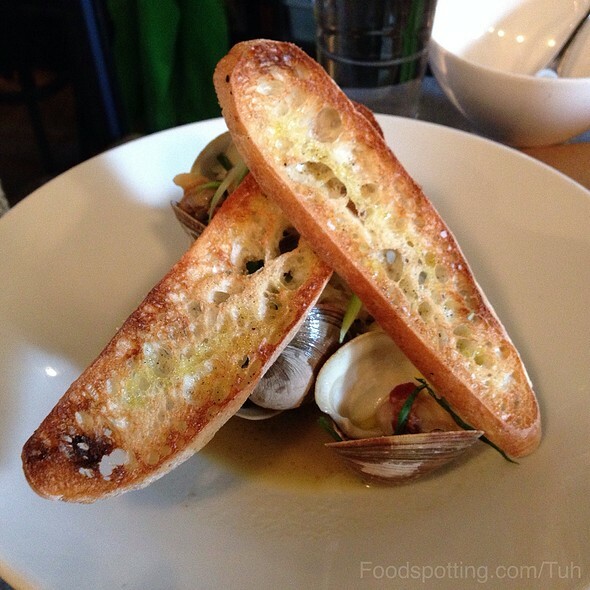 Fantastic food, excellent service - a great spot to experience east coast seafood at its best! Michelle was a lovely server and was so nice to offer fried oysters and chocolate mousse on the house for my birthday. Great food, cute decor and ambiance, and service and will definitely come back! Let me start out by saying my dining partner and I did not have any oysters. According to the reviews they are fabulous and I have no reason to doubt it. Let me tell you about the meal we did have. We had the calamari and the Brussel sprouts for starters. They were both very good but not exceptional. I’ve had better at numerous restaurants. I had the fish and chips $19. There were a lot of fries and 3 small pieces of fish. It was disappointing as there was twice as much breading as fish. My dining partner has sea bass for $30. It was a very small piece fish. She said the sea bass were very good. The main issue is the price. The portions are small and the quality is good to very good but not exceptional. The fish was very fresh but so is the fish at other restaurants. A major concern was the spiral stairs down to the bathroom. They were not easy to descend or ascend, especially if you are elderly. They should have a bathroom on the main floor. This issue should be noted on their website, on Open Table and by food critics in their reviews. The description of the restaurant on the website and Open Table is misleading. Everything in the restaurant is old. It is in a crowded space and it is very loud. It has the feel of an old diner. I would not return because I can find seafood of the same or better quality at lower prices in in a more congenial and attractive space! Oysters were so fresh and tasty! Also had fried clam dinner and fish and chips which were outstanding. We were an hour early for our post production reservations. I called and the staff was very gracious about moving our reservations up an hour. Upon arrival there was some discussion about our table, and the staff accommodated our needs. 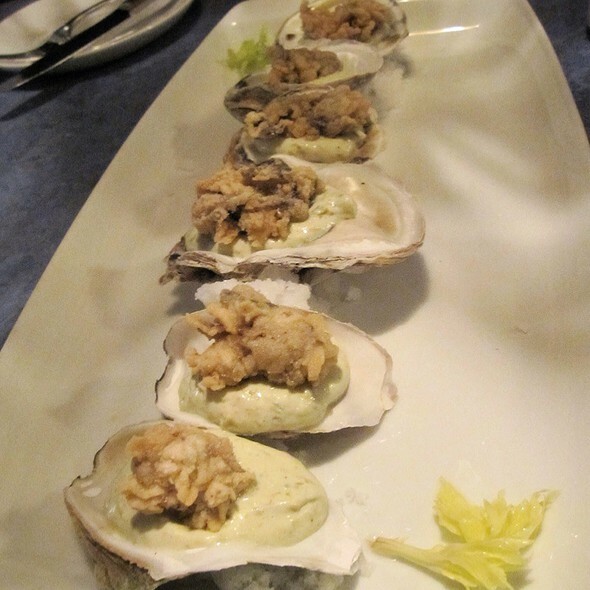 All of the staff is intimately familiar with the menu, including the ever changing selections of oysters. And they did not steer use in the wrong direction. The bouillabaisse was exceptional and satisfying. 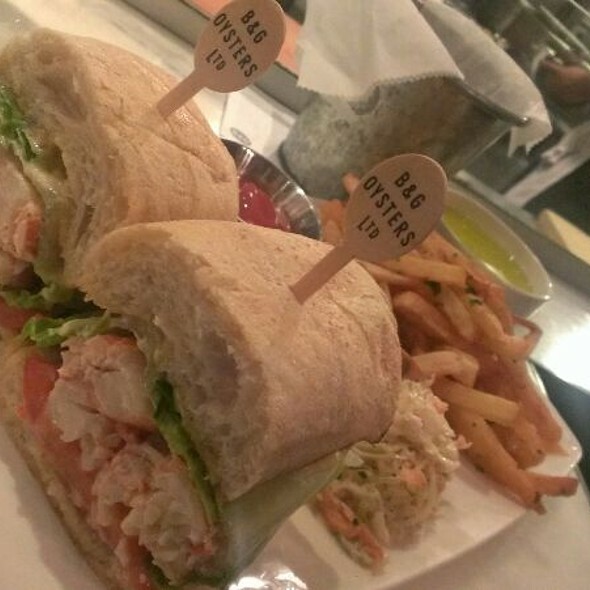 The lobster roll, very very, light on mayonnaise, was everything that you have read about it's awesomeness. And the wild oysters on the raw bar menu were to die for! If you love seafood, don't miss this restaurant. Excellent as always. Love, love, love their unique take on fried oysters. Grilled octopus and lobster blt kept pace. The sandwich was a 3-way share and they artfully performed the split in the kitchen serving us each our plate. Great service. This is one of my favorite lunch venues in Boston. It is located on a charming block of Tremont Street and it is a stimulating environment to dine in. I prefer to dine at the bar and it is always entertaining to watch the live action in the open kitchen. 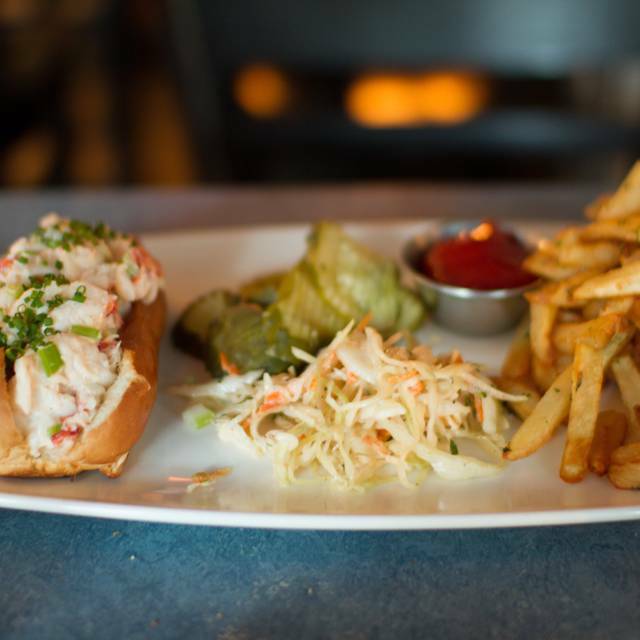 The seafood, lobster rolls, lobster club and side dishes like Mac n’ Cheese and Brussel sprouts are well balanced and incredibly fresh. The restaurant tends to get loud when it is crowded but the food and friendly staff trump the noise level. LUNCH, DINNER, NEVER A DISAPPOINTMENT! WE LOVE B&G, WAIT STAFF ARE FANTASTIC AS WELL AS THE CHEFS AND FRONT OF THE HOUSE GUYS!!! Never disappoints! If I lived in Boston, this would be my local ... since I don’t, every time I’m there I try to visit B&G. Fabulous oysters, and everything else. Friendly service, well matched wines by the glass. The serving size of my halibut ($32) was smaller than the inside of the palm of my hand, the mashed potatoes spread across the plate were barely warm, the cauliflower clusters around the plate were cold. The host and server were excellent, but the meal was less than satisfactory. I found this place in the idine program and saw that it was highly rated on TripAdvisor so I made reservations for a Friday lunch on Open Table. We didn't realize exactly where it was and how far it was from Washington St. area of downtown so we ended up walking about 3 miles in the cold rain, as well as a little sleet, from our hotel on Atlantic Ave. We made it in time for our reservation, found the side entrance, and went in. We were seated at our choice of table, which was one with two high chairs so I could hang my wet jacket. Juan G, per the receipt, was our server. He and several others took great care of all the diners. My water was refilled often. One concern was the spiral stairs down to the bathroom. They were not easy to descend or ascend for someone over 50. I hope they had another bathroom on the main floor or an elevator for those who couldn't maneuver these steps! The food was mostly good. I had fish & chips $19, and the fish were a bit soggy. There were a lot of fries and 3 medium size pieces of fish. My other half had Fried Clams and Sweet Potato fries $26. He said they were very good. We both started with a bowl of lobster bisque $18 each. It was decent with a few chunks of lobster. I've had better and much worse. My main issue here was the price. I've had similar or larger portions of the same dishes in London (fish & chips), Boston harbor area (Lobster Bisque), and the north shore (fried clams) and paid less in each case. I realize their items are very fresh but so are the others. I guess they have the crowds in the evenings to justify their prices. I doubt I would return here because I could find seafood of the same quality at better prices in more convenient places! Such a great restaurant. I love the ambiance, busy, bustling but never annoying. Amazing oysters but the halibut tartare -- crazy great. You can go with a group or I go by myself and sit at the bar. A real treat. THANK YOU. Too expensive for good but not great food. Really small portions. Not especially exciting, though we ordered what should have been exciting dishes. Hands down... B&G is our favorite restaurant in Boston. Every time we travel to Boston (from Long Island) we HAVE to go to B&G! Their oysters are beyond reproach. They are extremely fresh. When you are eating a B&G oyster you are transcended to the beach with the subtle taste of the salty brine. Follow that with the delectable fried clams and a little octopus ceviche. Certainly, all this must be washed down the house chablis. Couple the amazing food with a great server like Michelle and your time at B&G is five star! We went on a busy Saturday afternoon and Michelle still managed to take time to chat with us and make us feel special! Now you know why B&G is our favorite restaurant in Boston! Great spot! Good atmosphere, menu and the food was terrific. Easy place to share food or order on your own. B&G never fails to provide some of the best seafood in Boston in a cozy atmosphere with spot-on service. 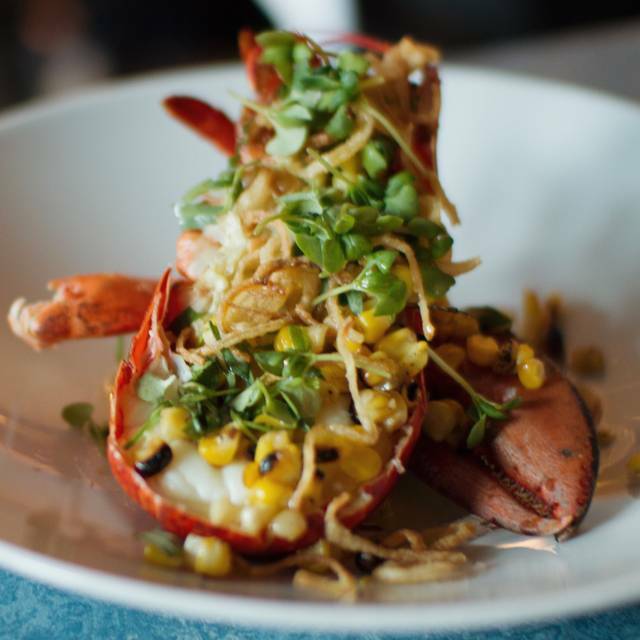 B&G is such a favorite of locals and visitors alike because it is the perfect expression of bringing high quality, local and fresh to a tiny "neighborhood" seafood restaurant. 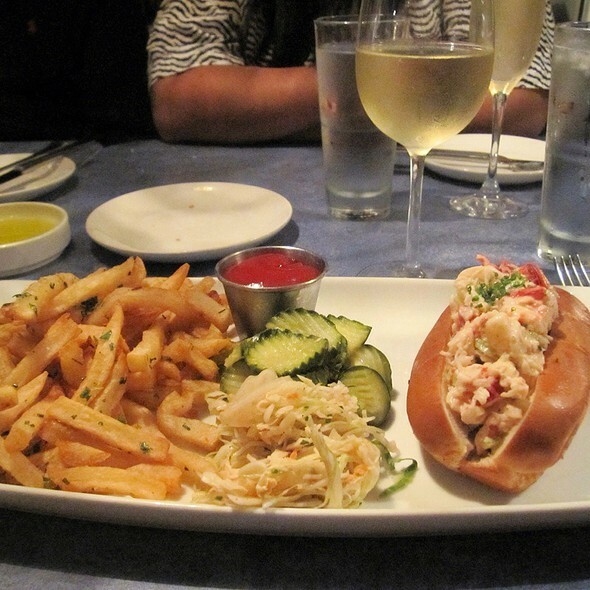 You can come in and split a lobster roll and have a glass of wine -- as we have done -- for a nice inexpensive date or you can come in with caviar on your mind and order a bottle of champagne, as we did this night. Everything from the glass of Prosecco while we waited for our table to be ready to the dessert at the end (chocolate mousse!) was simply outstanding. The caviar service, which is not inexpensive, was the best way to start the meal (well, along with the bowl of chowder my companion had) and then we indulged in the friend clams and a lobster roll (I got the salad with that, since there are enough French fries on one sandwich plate for two or more people). Yes, B&G is pretty much always busy because it is small and it delivers quality. But, I have never really waited more than 10 minutes when I make a reservation and if you go early or late you can almost always score seats at the counter. Loved our meal at B&G. The food was fresh and outstanding and the service was attentive. We will be back. this is a great place especially for seafood. Recommend making a reservation in advance but definitely worth the wait. The oysters were amazing! Pretentious bartender ruined the vibe and not to mention the over priced wine and oysters. Lovely all around, as usual! Everything was perfectly executed! We had the side salad as a starter, wanting something light- delicious dressing. Then on to tagliatelle with lobster and crab and the halibut. Scrumptious blend of flavors. And the server was right on the mark with wine recommendations. I was disappointed that I paid so much for such a tiny, "Ok" lobster roll. It was more expensive, but not nearly as good, as several other lobster rolls I've had in the city. The rest of my group all ordered pasta dishes, which seemed like a better choice. Great atmosphere here, our server was wonderful, and the wine was very good. One of my favorite little places. The fried calamari starter was very good and a big portion. The bouillabaisse was excellent. 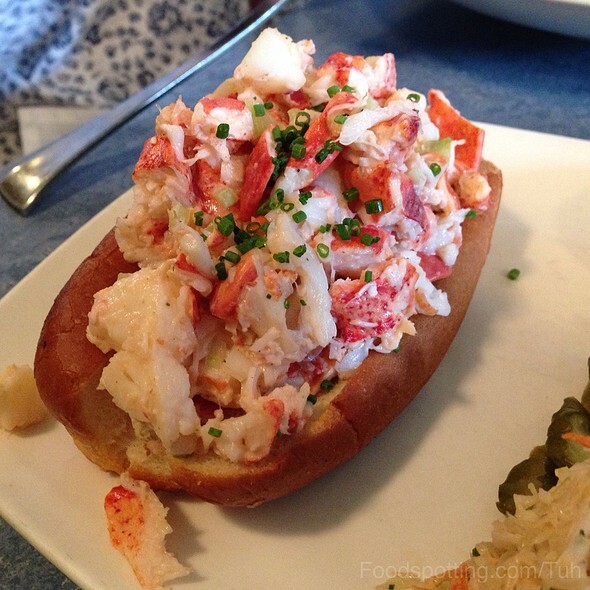 I can also recommend the Lobster BLT and the classic lobster roll. Staff is friendly. It surely isn't a cheap place, but the value for money is fair. And the wine list has some excellent Austrian white wines that you usually don't find outside of Austria... whoever sourced the Austrian wines knows what they are doing. Great place. Unpretentious. Perfect for after a show or game when you want great food without fuss. Nice wine list. We are never disappointed at B&G, stopped in last night about 9 after a show and were met with the same wonderful and cordial service. Great food and service during dinner, as always. I took my grand mother for her birthday and we had a wonderful lunch! Service was excellent, very attentive, without being unnoying. But most importantly, the food was amazing! We had super fresh, delicious oysters, crab salad, and a lobster roll. For desert we had panacotta and chocolate mousse and they were so good as well! I would highly recommend this restaurant to all seafood lovers. Quaint and cozy. Very attentive and friendly waitstaff. Delicious food albeit a bit pricey but worth it for a splurge! Oysters were fantastic! Very accommodating with food allergies and even flexible with reservation when I called to ask if we could be seated early!